MAG 349w3 Infomir IPTV/OTT Set-Top Box WiFi 2.4Ghz Built-in UK/US/EU Power. 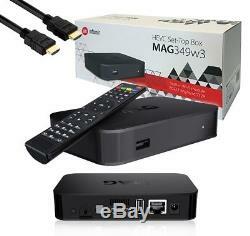 MAG349w3 is a powerful set-top box containing a high-performance processor on the BCM7250 chipset, and 1GB RAM. It's the optimal solution for quick launch of your IPTV/OTT project. This device comes with the most advanced features, making its performance extraordinary. A larger RAM and heavy-duty processor allow you to enhance the velocity of STB. HEVC technology, used in MAG349w3, requires smaller network bandwidth for provision of video of higher quality. MAG349w3 is equipped with dual-band Wi-Fi and ultimate Bluetooth adaptors that provide additional connection opportunities. Premium Class IPTV/OTT Set-Top Box HEVC technology support MAG349w3 is equipped with video compression technology, used to play back video of high quality. Increased Productivity Larger RAM and powerful media processor by Broadcom allowed us to increase the velocity of STB High-Quality Sound and Image The audio output S/PDIF allows connection of a multichannel high-end system to the Set-Top Box. HDMI 1.4A provides the highest quality sound and image. Improved connectivity MAG349w3 is equipped with a dual band Wi-Fi module, Bluetooth 4.0 LE and USB 2.0 ports. This expands the Internet connection and external carriers' usage opportunities. 265 (HEVC), MPEG4 part 2 (ASP), WMV-9 (optional), VC1 video, XviD; 3D and HD video supporting Video containers MKV, MPEG-TS, MPEG-PS, M2TS, VOB, AVI, MOV, MP4, ASF, QT, WMV Image formats JPEG, PNG, BMP, GIF, RAW Subtitles DVB, SRT Playlist formats M3U Box Contents MAG349w3 Set-Top Box HDMI cable Remote control 2 AAA batteries Power adapter 12 V 1 A. UK /US /EU Power adapter, based on customer location. Different Location Cost you different time. Different Country and different Location Cost you different time. We will not be responsible for item loss due to wrong or unknown address. We will try to resolve issues. In most cases problems are usually due to use error and can be fixed remotely. If the item is simply unwanted i. This way you are insured in case of loss or damage to your package. For over 9 years, we sell IPTV and Android TV equipment. By this time we gained experience allows us to offer services at the highest level. We strive to attain customer loyalty through superior product quality, low Prices and excellent customer service. (Our feedback speaks for itself). Our prices are low because we import all our goods and accessories directly. This allows us to attain only truly authentic products and pass the savings on to our customers. Newtech Store does not have a retail high street shop, instead we have a warehouse that holds all our imported stock and online sales are automatically sent to the main warehouse for distribution to everywhere around the world. 100% customer service is our goal, just take a look at our feedback. The item "MAG 349w3 Infomir IPTV/OTT Set-Top Box WiFi 2.4Ghz Built-in UK/US/EU Power" is in sale since Thursday, December 28, 2017. This item is in the category "Sound & Vision\TV & Home Audio Accessories\Internet TV & Media Streamers".82" and is located in London. This item can be shipped to all countries in Europe, United States, Canada, Australia, Brazil, Japan, New Zealand, China, Israel, Hong Kong, Mexico, Singapore, South Korea, Thailand, Chile.